Cloud is pretty new to most of its users and therefore, there is often a lack of expertise in selecting the right combination of cloud services that would suit your business needs. Many organisations end up purchasing bigger and expensive machines to avoid downtime failures. What companies need to understand is that Bigger Is Not Always Better! If you were to analyse the costs a little deeper, you might find that you have just incurred a huge loss. It all boils down to this single question: Can I achieve transparency in Cloud Cost? The answer is an unequivocal YES! With BluePi’s cost optimization services, you absolutely can. 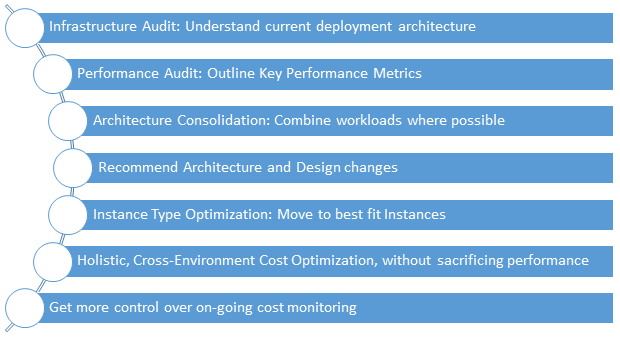 We not only optimize, but also automate, refine and standardize your infrastructure. We provide you a holistic business view of the cloud ecosystem. By optimizing your cloud costs, we utilize almost 100% of the resources available, ensuring availability and performance across all your workloads. Most of the times there are those unused cloud instances that are stealthily burning a hole in your pockets by being forgotten. At Bluepi, we do more than just a basic sweep of your infrastructure and applications; simply because real-life is more complicated than that. Once we are through with scanning your system, all those so-called forgotten instances will be shut down for good, saving you a huge amount of money! At times, our clients ask us: What if I am utilizing all my resources but still incurring high costs? It simply means that your resources are not unused, they are just over-sized. Sometimes, organisations tend to overestimate their infrastructure requirements. BluePi helps you overcome such situations by thoroughly studying your existing system infrastructure and recommending the right sizes for your deployments. And that’s precisely what BluePi does. We employ a comprehensive framework-led approach to leave no stone unturned. Here’s what it usually involves: Do not just use the cloud, we make a commitment to truly leverage the cloud and gain an edge over your competition.